Bravely breaking stereotypes with hardwork and determination, women have come a long way. There is no field of expertise that has missed the hand of a women in it. Great stories are to be told, for one never knows, who finds wings. 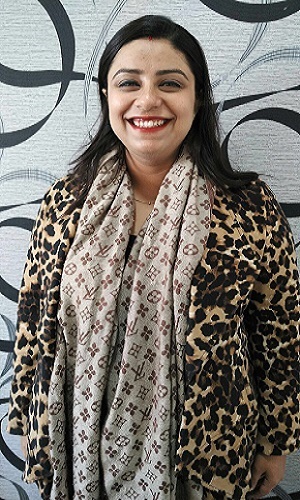 With the intention of extending hope, and fueling courage to many dreams, here we bring an exclusive interview of Parul Bhargava, the woman in power, the CEO of vCommission. Now we know for sure, there is hope. The world is changing, and it's time for you to become the game changer of your life too. Iona: What is the one unique thing that inspires you to excel and keeps you going every day? Parul: For me, there is not one specific thing that inspires me to do better every day. I believe inspiration comes in the smallest form, amongst the many things we do, in our routine lives. I vouch by the fact that hard work and dedication towards achieving your goals is a sure shot way to success. I am committed to my company vCommission, and its growing network of clients and the good work we showcase, really keeps me going and inspires me to deliver my best to the team. Client satisfaction and the smile on my team's face when we manage to execute big campaigns successfully, makes it all worth the effort. I also look upto my business partner and now life partner, Mr. Tarang Bhargava, who inspires me to be better than the best. The biggest challenge I put up for myself, is to always excel in executing his strategic plans, above his expectations. It is all about focusing on that one goal you wish to achieve, the rest just falls in place with dedication and sheer hard work to accomplish it. Iona: What’s the best thing about being a woman in today’s world? Parul: I consider myself very lucky to be born in this era wherein a woman walks hand in hand with the world. Today, we are full of power, opportunities and support to achieve our dreams and find a recognition for ourselves in all fields. Awareness about gender equality, female education and saving a girl child have turned the face of this century. I have a loving family that supports me to pursue my dreams, an excellent team that drives force to make our business successful and a trusting business partner who believes in me for taking all the strategic decisions beneficial for our business. I believe, if given the right opportunity women can do wonders to any task they take up. Today, we have amazing female leaders across various fields, be it politics, sports, science, entrepreneurship or media. I have met many amazing women in the field of media itself, who are leaders in their organizations and are doing a wonderful job of delivering innovative ideas and strategies to the digital world. Today, we are self-independent at the same time dedicated towards our family responsibilities. Women have made their mark in the society with their strength and intelligence, and compelled the world to take us seriously.With the right support and good education we can change the face of our country and I am blessed to be a part of this transformation. Iona: What’s your idea of empowerment for women? Parul: Give us an opportunity, and trust us to do our job well, these are the only two things women need to make it big in their lives. Also, Quality education and the right support can make us go places and achieve success in any endeavour we take up in life. Iona: When on a wanderlust, where would you set off to? Parul: Serene beaches are where my heart wants to be each time I need to unwind. When on wanderlust, it has to be Phuket and Krabi. Both these places have memories that I hold close to my heart.